This cry, and others like it, were made by disheartened Confederate troops on the first day of fighting at the battle of Gettysburg. Under the impression that they faced untrained militia, the Rebel troops quickly recognized the distinctive black Model 1858 “Hardee” hat worn by the famed “Iron Brigade of the West” and realized they were in for a fight. Composed entirely of Western troops from Wisconsin, Indiana, and Michigan, the Iron Brigade had earned its reputation in battles like Second Bull Run and Antietam, and they lived up to it at Gettysburg, suffering incredible casualties while repelling numerous Confederate attacks. 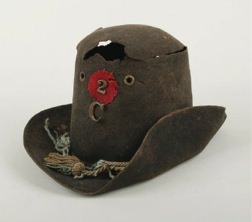 While many photographs, letters, and diaries from Iron Brigade soldiers survive in archives and museums today, only one of the iconic Black Hats that saw battle at Gettysburg remains, and it can be found in the collections of the Wisconsin Veterans Museum. Sergeant Philander B. Wright, Color Sergeant, Company C, 2nd Wisconsin Volunteer Infantry Regiment, wore this hat as he led the charge of the Iron Brigade on the morning of July 1, 1863 outside the town of Gettysburg, PA. Advancing only a few more steps, Wright finally halted when a bullet slammed into his left thigh and another into his arm, knocking him to the ground. Wright survived Gettysburg, but did not return to his unit. His son Mark Hatfield Wright donated his black hat. You can see Philander’s Black Hat and other Civil War artifacts for yourself on display at our museum.